Dr. Peter Lotsikas is board certified by the American College of Veterinary Surgeons and the American College of Veterinary Sports Medicine and Rehabilitation. Dr. Lotsikas graduated with a BS degree in Biology from Virginia Tech and a DVM degree from the Virginia-Maryland Regional College of Veterinary Medicine. He then completed a general small animal internship at Kansas State University, followed by a surgical internship at the Dallas Veterinary Surgical Center. He received his formal surgical residency training at Iowa State University. Dr. Lotsikas returned to his home state of Maryland in 2007. He was an associate orthopedic surgeon at Veterinary Orthopedic and Sports Medicine Group (VOSM) in Annapolis Junction Maryland for four years prior to becoming an owner at CARE Veterinary Center in Frederick Maryland. Dr. Lotsikas sold his ownership of CARE in 2014 to found Skylos Sports Medicine. 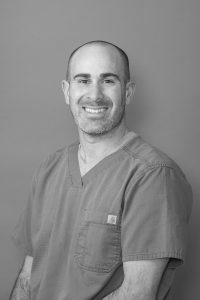 Dr. Lotsikas serves as a veterinary surgical consultant for Arthrex Vet Systems and is a national instructor in arthroscopy and minimally invasive knee stabilization. He is credited for developing the technique guide for the TightRope System for stabilization of traumatic hip luxation, currently used worldwide. Dr. Lotsikas is also on the medical education advisor board for Zoetis and is a Zoetis ELITE speaker on pain, anesthesia and sedation. He has contributed to numerous publications in peer-reviewed journals and co-authored a chapter in the textbook Mechanisms of Disease in Small Animal Surgery. Dr. Lotsikas recently served as section chief/author for the chapter on orthopedic disorders of the hind limb for the textbook Canine Sports Medicine and Rehabilitation. Dr. Lotsikas is currently a scientific reviewer for the Veterinary Surgery Journal and Journal of the American Animal Hospital Association and has served as a scientific reviewer for the VOS and ACVS Symposiums. Dr. Lotsikas is very active in the continuing education of veterinarians and has presented at nearly every major veterinary surgery meeting in the United States. He is a frequently requested author for Clean Run Magazine, Pointing Dog Journal, Retriever Journal, and Just Labs Magazine on sports-related injuries in the canine athlete. Dr. Lotsikas specializes in sports-related injuries and returning performance and working dogs back to full function. His clinical focus is on minimally invasive surgery and total joint replacement. Dr. Lotsikas is certified to perform Biomedtrix Hip Replacements, the TightRope CCL and TPLO procedure for cruciate repairs, Sliding Humeral Osteotomy procedure and CUE joint resurfacing procedure for elbow dysplasia. Dr. Lotsikas also incorporates Orthobiologics as appropriate. Most importantly, Dr. Lotsikas prides himself on tailoring his surgical and medical recommendations to meet the needs of his diverse patient population. Whether it is an elite athlete or an aging companion, Dr. Lotsikas focuses on getting to know the individual to ensure the best possible outcome for each patient’s particular needs and goals. Dr. Lotsikas is married to Dr. Faith Lotsikas and has three young daughters. They have a small farm in Myersville, Maryland. His personal interests include fishing, hunting, golf and farming.